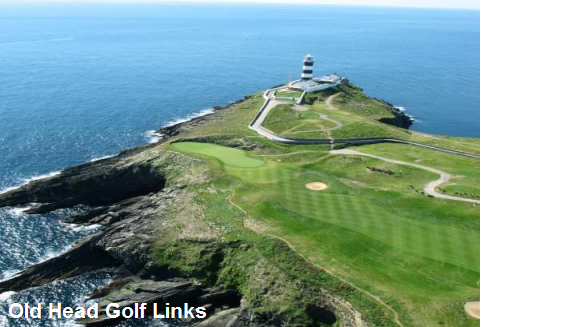 Southwest Ireland is the top destination for golfers traveling to Ireland, play the great links at Ballybunion, Lahinch, Waterville, Old Head, Tralee and more. Ireland Golf Vacation at its best! Scheduled arrival at Shannon Airport, drive two hours to Killarney your base for the next four nights. Drive the beautiful Ring-of-Kerry (90 minutes) to play the championship links course at Waterville. Forty minute drive to Tralee to play Arnold Palmer’s seaside links course, his first in Europe. Drive two hours to play the new Old Head Golf Links with some of the most spectacular scenery of any golf course in the world. Off to Ballybunion (one hour) to play the world renowned Old Course. Ballybunion has been rated one of the top golf course in the British Isles, and it is easy to see why this is one of Tom Watson’s favorite courses. After golf drive two hours to the Lahinch area your base for the next two nights. Play the championship seaside links course of Lahinch; don’t miss the magnificent Cliffs of Moher, twenty minutes from the course. Drive (1 hour) to Shannon Airport for departing flight. SELF DRIVE AUTO RENTAL: Based on 4 sharing a manual shift van and includes unlimited mileage, and collision damage waiver (CDW). GROUND TRANSPORTATION OPTION: For 8 sharing a bus & driver who is also a trained guide in Irish History add $475 per person. All prices are subject to availability and subject to change.